As we continue to bask in the beauty of these summer weeks, we are reminded in today’s gospel to get away to a deserted place and rest for a while. What a beautiful image for us to see from the Lord Jesus as we enjoy the rest and relaxation of these summer months. Although we may be on vacation from work and school, we must never be on vacation from our life of prayer. Whether we are traveling to distant places or staying local, we must always make time for our Sunday Mass obligation. As Catholics, the Eucharist is the source and summit of our faith. Jesus nourishes and sustains us with his most precious Body and Blood. We must never turn away from him, knowing that he will never turn away from us. This Wednesday, July 25, we celebrate the feast of St. James the Apostle. He is one of my favorite saints. He was chosen by Christ himself to be one of his apostles. A fisherman by trade, James left everything, including his mother and father to follow Jesus. St. James is the patron saint of pilgrims who journey to distant places to encounter the Lord. 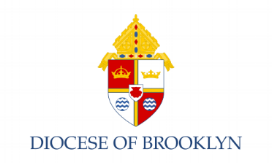 St. James is also the patron saint of the Diocese of Brooklyn, which our cathedral is named after. Just about 3 years ago, I had the great privilege of bringing 30 parishioners from my former parish to Spain. I celebrated Mass at the high altar of the massive cathedral of Santiago de Compostella, where the remains of St. James are buried. We pray through the powerful intercession of St. James that each of us will have the courage to drop everything and follow the Lord. Next weekend members of our youth group will be participating in this year’s Kujenga youth leadership retreat. The word “kujenga” is Swahili meaning leadership. Almost 100 young men and women from the Diocese of Brooklyn will participate in this retreat which will be held at the Seminary of the Immaculate Conception in Huntington, New York. In your kindness I as you to pray for our young people on retreat next week, that the Lord will bestow his abundant blessings upon them as they take on leadership roles in the Church today. This weekend we welcome back to St. Martin dePorres Parish Father Joel Cariaso. For the last two years, Father Joel has spent one month with us here at the parish as summer priest help. Father Joel is from the Philippines and serves as Rector of St. Nicholas of Tolentine Cathedral in his Diocese. In addition, he serves as Vicar for Religious Orders in his Diocese. Please be sure to welcome him back to his summer home here in Brooklyn! I take this opportunity to thank each of you for your support and generosity towards this year’s Annual Catholic Appeal. Our goal for the year is $59,519. As I mentioned, if each of us can participate in some way, we will be able to achieve our goal. As of now we have pledged $18,975 with 64 families participating. Anything that we make over the goal comes directly back to the parish. There are extra pledge forms at each of the three churches. Thank you for your support and generosity.